March Madness 2010 has begun and there is no dearth of NCAA related applications and iPhone apps that look to capitalize on the huge attention span from millions of fans across the US. I just came across a new app via TechCrunch called TweetBracket by YCombinator startup 140bets.com. TweetBracket is an interesting mix of NCAA interest and Twitter. And it is very simple to use and play. 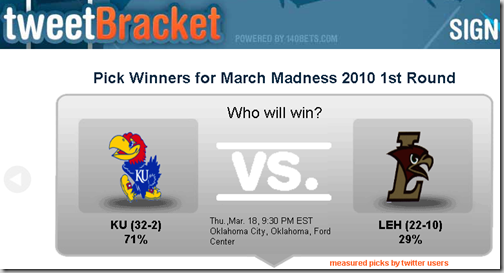 Sign in to Twitter using oAuth and get presented with a random matchup from today’s games. select the team you think will win, optionally tweet your choice to your followers. Rinse and repeat. You connect your Twitter account with 140bets with your email and they keep track of your picks throughout the tournament. prizes are awarded to tweeps with most correct predictions for each round. After a couple of picks, it presents your followers so you can invite them to play as well. TweetBracket is a very interesting sign of apps to come based on binary answers from Twitter users like the earlier Tweet Idol app. 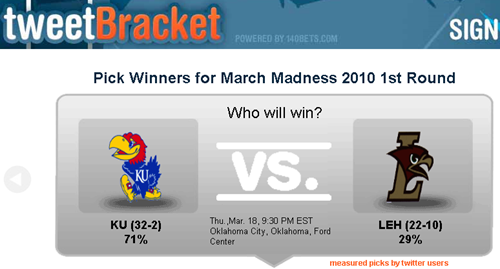 So, have a little fun with your Twitter account in the March Madness 2010.